All right, so some people who know me might roll their eyes at me mentioning yet another car I am in love with. In the past it has been a Lamborghini Huracan, McLaren 650s, Porsche 918 Spyder, Ferrari LaFerrari to name but a few but these are all supercars, all cars I have had the privilege to see, hear and also been able to touch and some even been taken for a very fast (hold on to my hat) drive in, sometimes noisily uncomfortable and not very lady like to exit! I loved them all though. So NOW in my older age I want to truly slow down, I want to start taking it easy and soak up every bit of life I can, look up to the sky, breathe the fresh air (when out of the city), indulge in true refined luxury and go on my adventures around the county and feel, see, hear, smell that what I am driving and arriving in is my everything and that everything is my new love. This super luxury car is the exact car I have been dreaming about, a stunning drophead four seater that I have heard is attracting a younger entrepreneurial crowd….like moi. Luxury car of the year. The most luxurious four-seater super-luxury drophead car. ”The global unveiling at the 2015 Frankfurt International Motor Show was the day of the new Dawn. 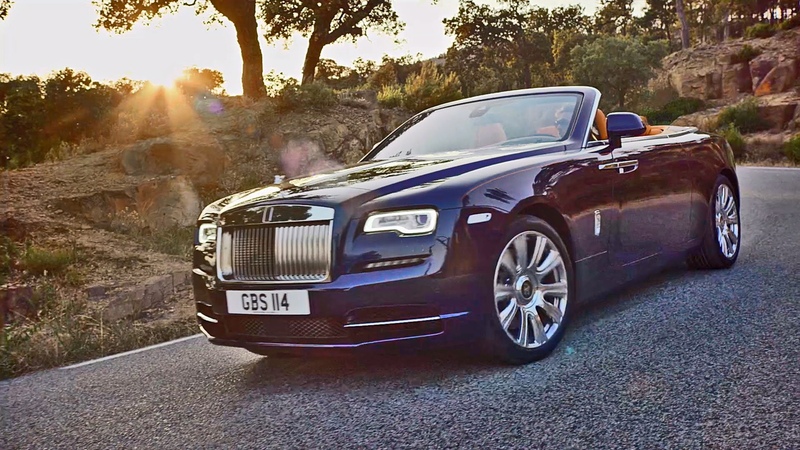 Rolls-Royce’s new Dawn; it delivers a cool, contemporary interpretation of what a super-luxury four-seater convertible motor car should be – rare, refined and the most social super-luxury car there is. It takes inspiration from the Silver Dawn, a famous and rare Rolls-Royce name that was only ever applied to 28 very special dropheads between 1950 and 1954.” Rolls Royce”. I actually originally fell for the Wraith (Scottish word for image of a ghost or spirit) when it was unveiled at the 2013 Geneva Motor Show, my goal was set from that day to have my very own Rolls Royce in the future. How would I achieve that goal not being a HNWI? How on earth would I afford a £240,000 luxury car? I didn’t even own a home and I was working as a PA at the time! The thing is, I have had many goals in my life and I have always achieved and received by my sheer hard work, determination and mindset. I have a list (a dream board in my head) of what I want to attract into my life…the Wraith has now gone, and the Dawn is in. In the past I must admit I have visited many car show rooms to actually buy cars, I have had 10 new cars in….10 years I think! And plenty of bad experiences with sales people 90% of the time, I am guessing the mindsets of some of the sales people are not in the 21st Century, they need to realise not everyone is a time waster, anyway I will not name and shame just yet. So walking into Rolls Royce in my ”on trend” smart casual wear being the confident business woman I am, I was in two minds…Would I be frowned upon or would I be ignored? Or both!? It always seems a trauma going into these luxury places, the thing is to remember, be confident, be happy or be ready to be told to leave. But, oh my goodness….I could not have had a warmer welcome in my life! Did they know me? was there an A lister celeb behind me? I had to check to see if they were really talking and acknowleding me, me Millie Cooper the petite unassuming business woman who mixes up Dior with Primark, has that just got out of bed hair and a sometimes quiet voice who no one hears (I am a person who people tend to ignore as I don’t stand out in a crowd). Anyway yes Sarah Rothwell the Showroom Host greeted me with a huge smile and I was the only person in the showroom at that moment. Sarah made me feel so relaxed in what I would always have thought was a man’s world within Rolls Royce. I was given a tour of the showroom, an offer of champagne or tea, of course I took the champagne! I must have spent an hour or so with Sarah showing me the new Dawn, showing me around and letting me loose inside the car. After the champagne, a good look around the Dawn, a gossip about the love of cars, all things luxury and having to be prised out of the car by Sarah, she organised an appointment for me to come back to meet with one of the sales team a week later. I was actually counting the seconds not just the days to get back to Rolls Royce for my lunchtime Dawn appointment. I was called a few times to confirm my appointement and also sent a couple of emails welcoming me. Again I was still a little apprehensive to go back. I went as me again, Prada & Primark and had my 4yr old in tow with me that day. I called ahead and being the cheeky me I asked if there was any valet parking and no there was not but I still had a lovely person meet me outside to take my car away and park it up for me. I was also greeted at the door by a few people all smiling and saying hello (I was looking for that A lister), I was actually starting to feel famous myself now! I was introduced to Sean Knight one of the Sales Specialists, yet again I was blown away by how friendly he was….No champagne was offered this time but then I was going to be driving a £330,000 car! eeek!